One of Surin’s many high-end hotels, 97-room Twinpalms has gone in its own direction, boasting a minimalist Zen style to refreshingly modern effect. Ad Book now! Rates from US$220++. Average rating 8.9 from 477 reviews. The rooms have been done in cool, neutral colours and are an oasis of tranquility, with over-sized beds, rain showers and private terraces. The palm-lined pool stretches around the main part of the resort, giving ground-floor room guests the chance to leap straight into the pool from their terrace. All rooms have luxury linens and towels, WiFi, LCD TVs with DVD player and powerful air-con. Guests get to choose their own plush touches, including which flowers and ‘aromas’ they want for the room, as well as either a firm or soft mattress. A newer wing of the resort houses 21 ‘residences’, which are more like private condos of one or two bedrooms with a separate lobby entrance. The Penthouse residence has a private lap pool, movie theatre, kitchen, wine cellar, and two master bedrooms. If you have some money left after paying for the room, you can rent your own luxury yacht or a car covered in painted kisses. Other facilities include a spa, a library with Apple computers, DVDs and books, a wine bar, and if you head down to Catch or Bimi beach clubs – both owned by Twinpalms – you’ll get free towels and beach cushions. Though kids are welcome here, it’s far better suited to couples or groups of friends. Some good discounts are offered in low season months. * The author has previously done PR writing for this hotel so this visit was not done on an anonymous basis. Check rates at Twinpalms on Booking.com. For a poolside room add 2,000-3,000 baht per night. Room: Deluxe double room, low season: 4,500 baht, high season 10,400 baht. Notes: For a poolside room add 2,000-3,000 baht per night. 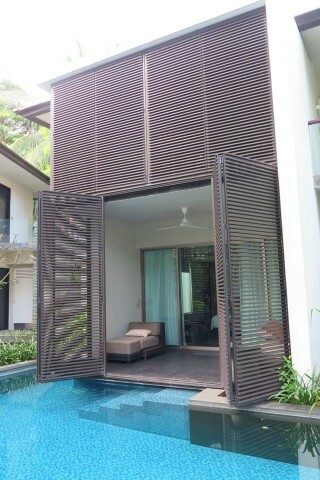 Room: Deluxe Suite, low season: 20,000 baht, high season 36,800 baht. Notes: Two-bedroom penthouse. Where are you planning on heading to after Surin Beach? Here are some spots commonly visited from here, or click here to see a full destination list for Thailand.